For some time now the motor racing and airline industries have been using nitrogen to fill tyres rather than air and this practice has now become the new trend in automotive tyres. In the near future we expect more and more retail outlets to offer nitrogen-filled tyres as a service. What are the advantages? Longer lasting correct tyre pressure. Having tyres inflated to the correct pressure is very important because it allows the tyre to more efficiently bear the weight of the vehicle and also helps to reduce tyre wear. There are minute pores in the solid rubber of a tyre wall and it is the leaking of air or nitrogen through these gaps which causes tyres to naturally lose pressure over time. However, because nitrogen molecules are larger than oxygen molecules, air leaks approximately 3 – 4 times faster from tyres than nitrogen, so having nitrogen-filled tyres can help maintain the correct pressure in your tyres for longer. Tyres heat up during motion and temperature affects the pressure within the tyre. Excessive heat buildup can cause tyres to wear out faster, or could even lead to tyre failure. Nitrogen disperses heat much more efficiently than compressed air so nitrogen-filled tyres run cooler, which helps maintain correct pressure, allows tyres to last longer and reduces tyre failure. Compressing air causes water to form which is trapped inside the tyre and wheel causing oxidation. This can cause damage to the bead of the wheels, rusting of the internal band of the tyre and eventually cause separation of the rubber from the bands. Damage to the bead of the wheel also increases leakage of air from the tyre. Since Nitrogen doesn’t produce water when compressed, it won’t cause this damage. All the above advantages add up to another big advantage – better fuel economy. Correct pressure lowers rolling resistance allowing the engine to work more efficiently and reducing fuel consumption. Nitrogen-filled tyres are also an advantage for vehicles which are always at full weight capacity, as the tyres are running at full load rating and the pressures within the tyres need to be constant for better fuel economy. Mixing Nitrogen and compressed air. 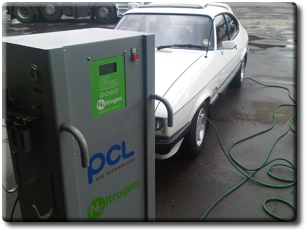 Some consumers are under the impression that you cannot top up a nitrogen filled tyre with compressed air if necessary. This is not the case. The air we breathe is a mixture of nitrogen and oxygen and so, of course, compressed air and nitrogen can also be safely mixed in a tyre. The only downside to topping off a nitrogen-filled tyre with compressed air is that you would lose the advantages of using nitrogen, but these can be easily restored by purging the tyre and refilling it with nitrogen. © 2019 Ashton Tyre Specialists Limited. All Rights Reserved.